All I Want For Krismas Is Michael Jackson!!!! Do anda beLIEve that this pic was taken after MJ's faked "death"? sorry this is not a soalan look at this"is mj alive"
Do anda think MJ will come back? 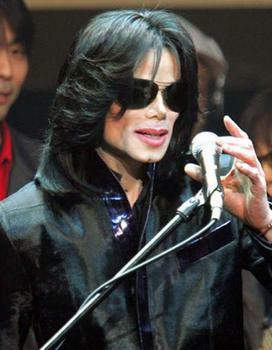 Do anda believe MJ hoaxed his death the 25 June 2009? We have been told that these 2 pics were taken a least 20 years apart. But were these pics taken possibly from the same year? did michael jackson really fake his death to save his life? What do anda think about the so called "dome project"? Dr. Conrad Murray refused to sign the death certificate. No physician at UCLA in charge would sign either. In fact no UCLA doctor has made any kind of statement confirming the death of Michael Jackson atau even that he was on the premises. Cause of death was listed as “deferred” until after the autopsy. The DC states that it is only valid if signed in purple ink. At the bottom it’s signed in BLUE ink. There are also many irregularities of the document which indicate it possibly isn’t legitimate. WACKO peminat-peminat of Michael Jackson have claimed the Thriller singer is alive – and due to make his comeback on a Welsh stage later this year. Conspiracy theories have swirled around the late King of Pop ever since his death in 2009, with supposed “sightings” of the singer alive and well cropping up around the world. i BeLIEve Mike is aLIVE! Hey, fellow MJ BeLIEvers if anda beLIEve there's lebih to MJ than this hoax and MJ still mystifies anda even in "death"... check out a new MJ club- MJJ Mystery Man. There is so much lebih to know. Come take a look at the new club and maybe we can figure it out together. Thanks anda MJ beLIEvers!!! a comment was made to the poll: Do anda beLIEve that this pic was taken after MJ's faked "death"? a comment was made to the photo: is this MJ alive? a comment was made to the article: MJ's Hoax Diary! the 991 was confirmed made from what hotel ?